Sometimes a house just needs a little loving to bring it back to the best version of itself. 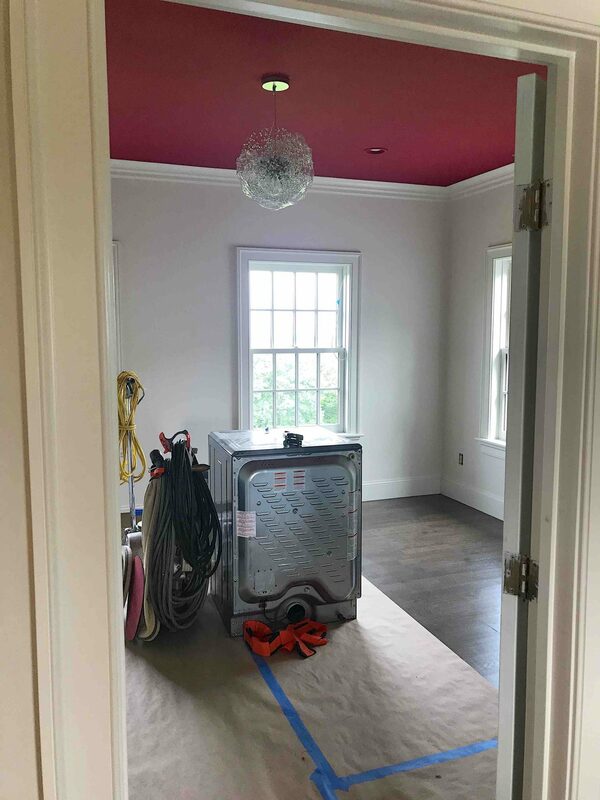 I have been working on the renovation of a Dutchess County home that I have grown to love. 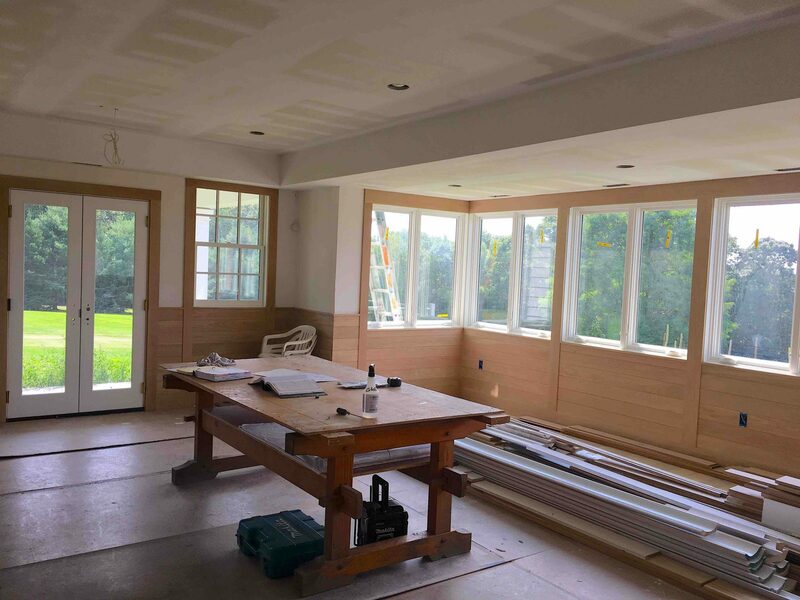 The project is taking shape and I wanted to give you a sneak peak at the progress. 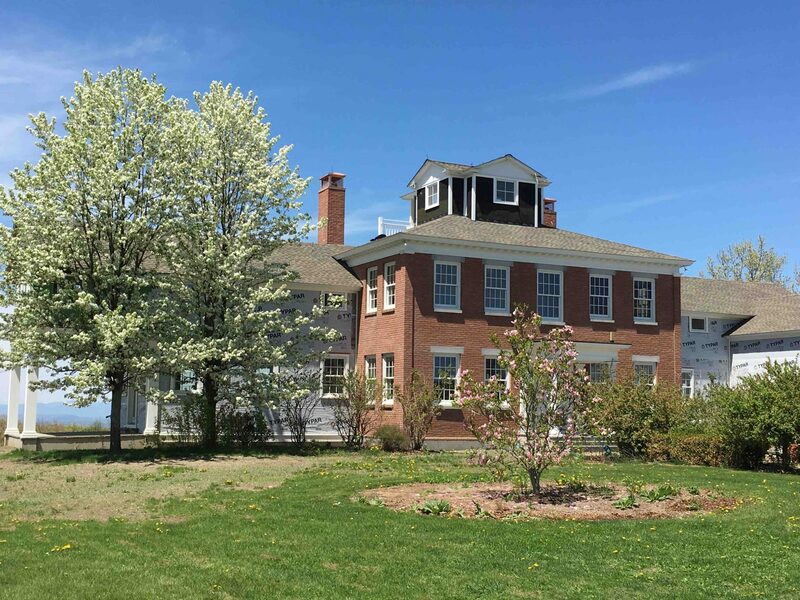 The home is situated on 85 acres in the rolling hills of Dutchess County, an area with deep history from the Dutch settlers in the late 1600’s to Franklin D. Roosevelt’s home in Hyde Park overlooking the Hudson River. 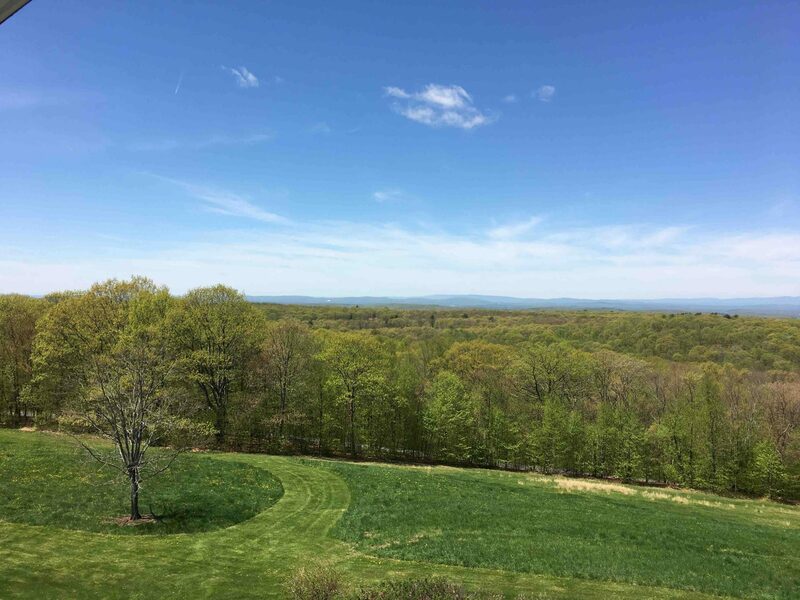 More recently, the Hudson Valley has been re-discovered as the playground for millennials from New York City and Brooklyn. 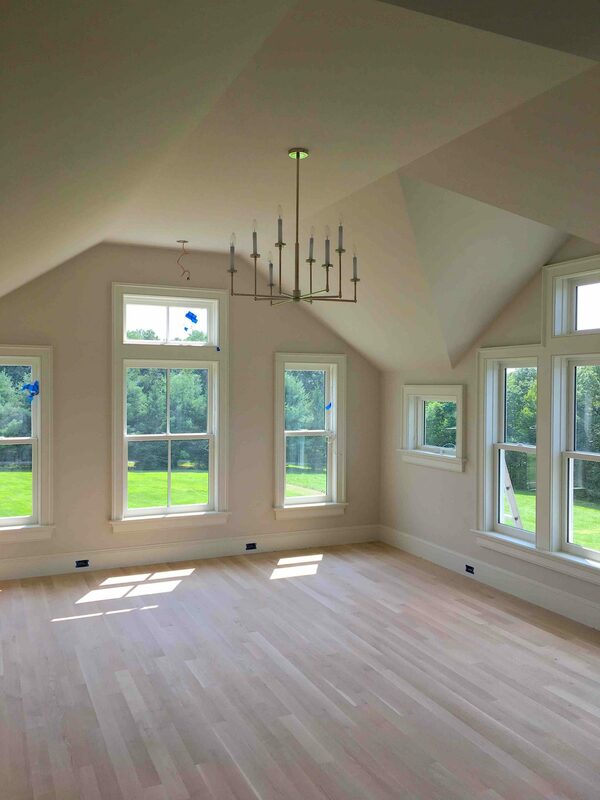 The goal of the renovation of this georgian colonial style home was to maximize the views, update the interior finishes, and reconfigure the layout to suit the family’s needs as this is their primary residence. 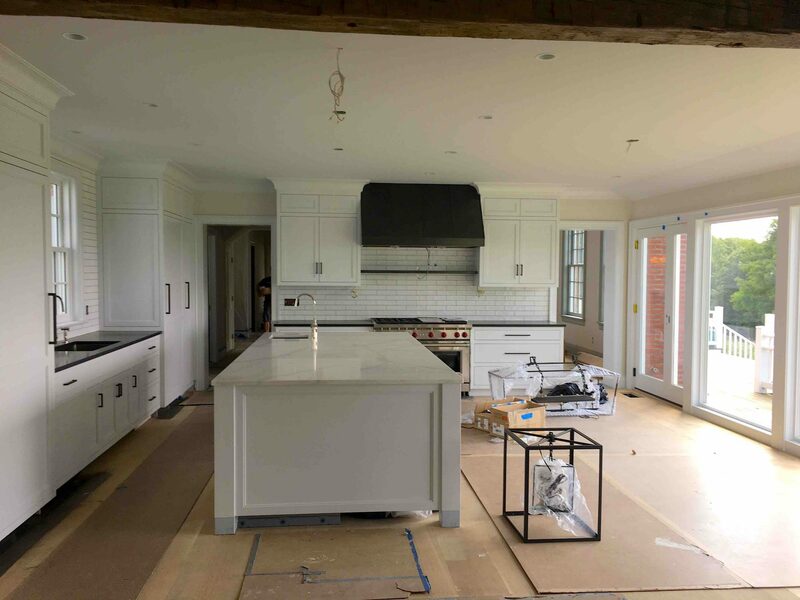 The clients hired Jimmy Crisp of Crisp Architects to conceptualize the redesign and Josh and Aimee Rich of Home Enrichment Company to oversee the construction. 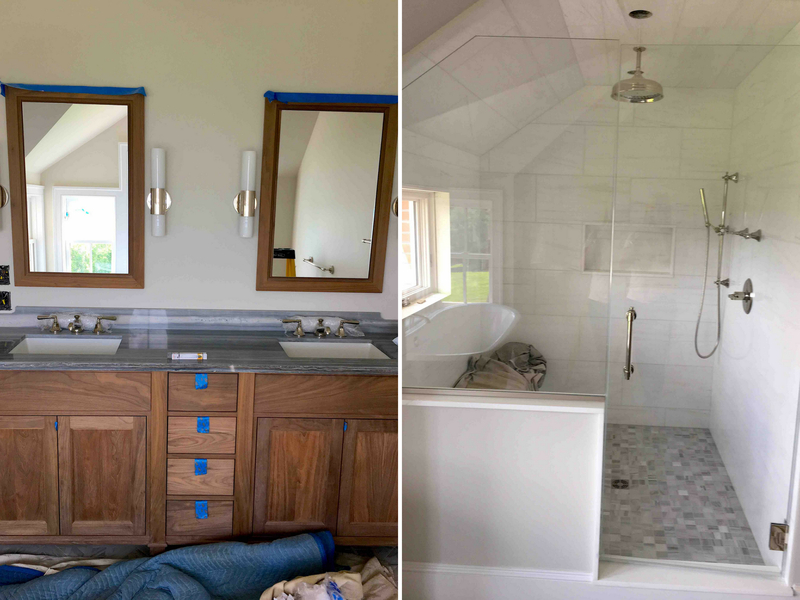 It has been a pleasure working with this talented and professional team on this transformation! There is a lot to love about this house. First is the breathtaking setting. Now – for the work-in-progress photos. We are targeting a move-in date in late Fall and promise installation and finished photos upon completion. 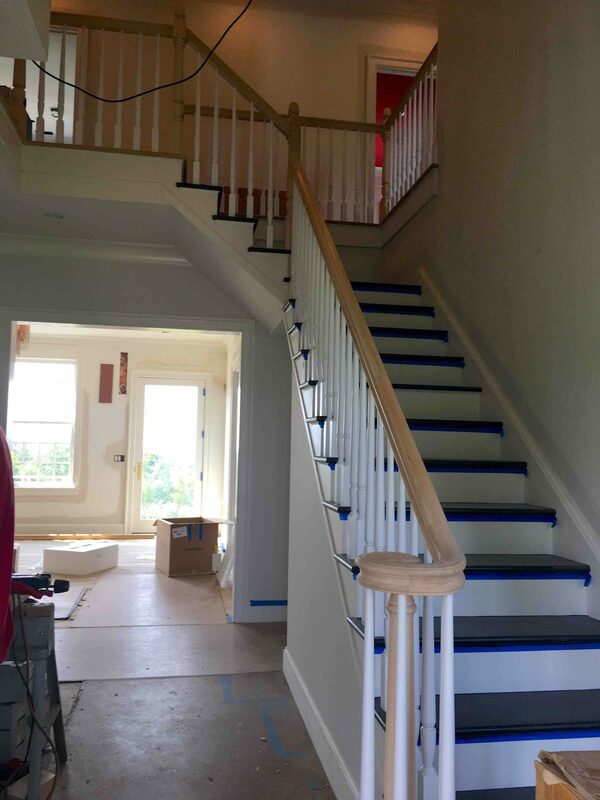 Updated the details for a more modern aesthetic with a new stair railing and dark paint on stair treads. 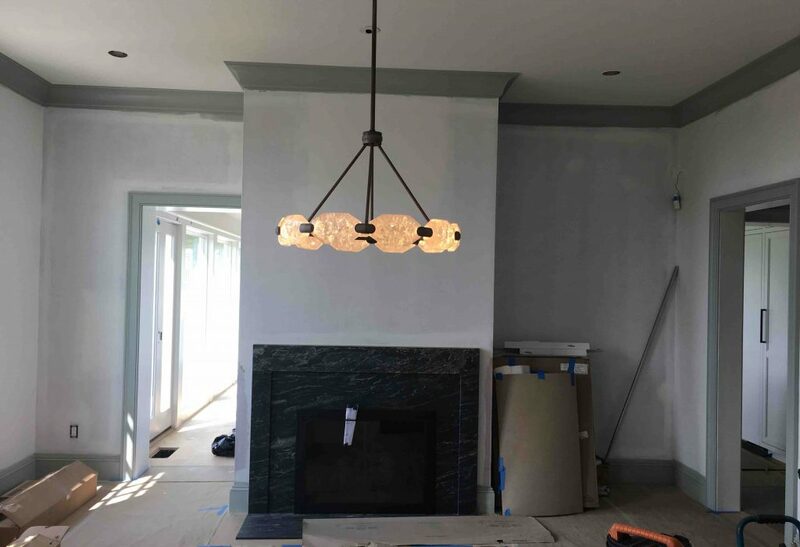 Custom VGI designed ceiling fixture with mica strips. 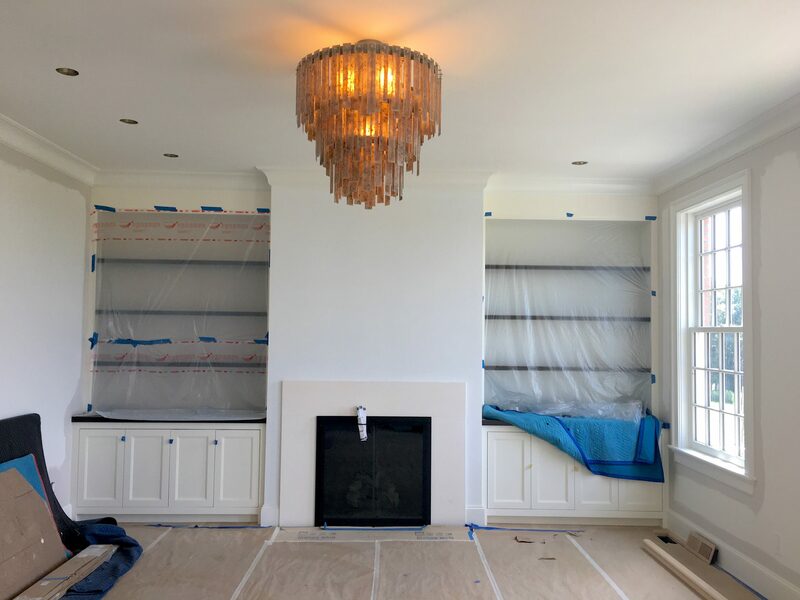 Still to come – Robin’s Egg Blue grasscloth wall covering accented by Black Forest granite mantel and rough cut sculpted glass ceiling fixture. 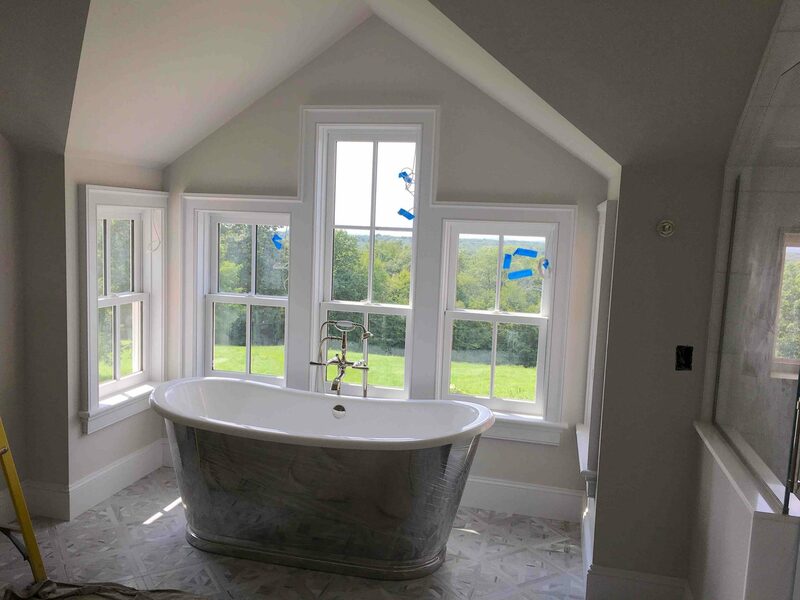 Windows were updated to create a solid wall of glass to capture the spectacular view. 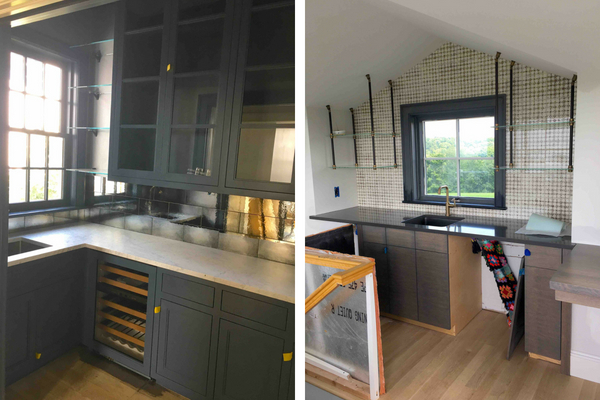 Modern farmhouse feel with white and black contrasts. Open flow from the kitchen. Black accents were carried through on the ceiling. 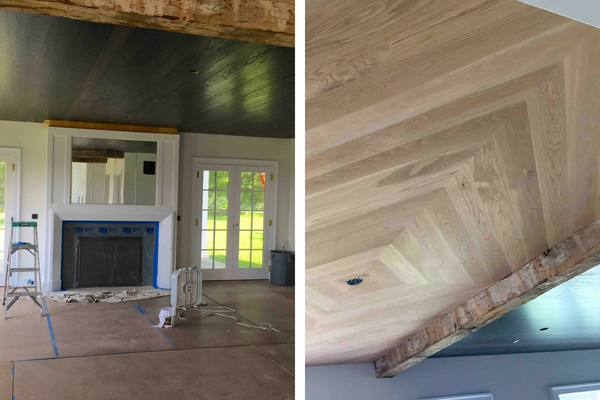 Diamond pattern and rustic beams were utilized to distinguish the transition of finishes. Dark ceiling and floor contrast with white walls. 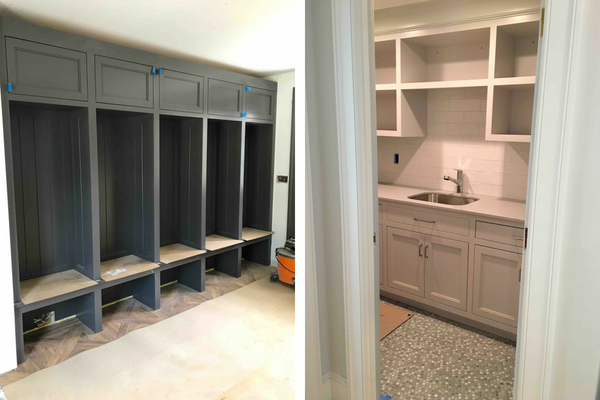 Butler’s Pantry – Sleek custom dark charcoal cabinetry with antiqued mirrored backsplash. 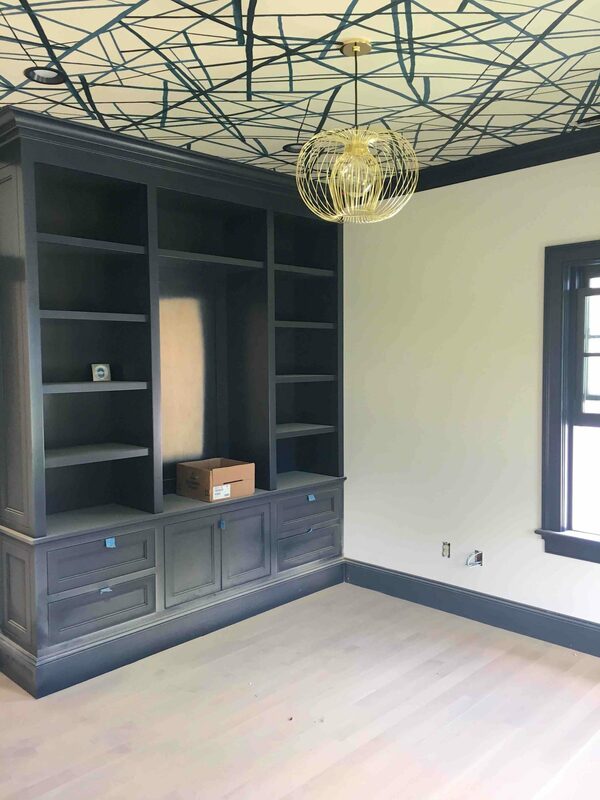 3rd Floor Wet Bar – Custom hanging metal and glass shelves. Handpainted ceramic tile backsplash. 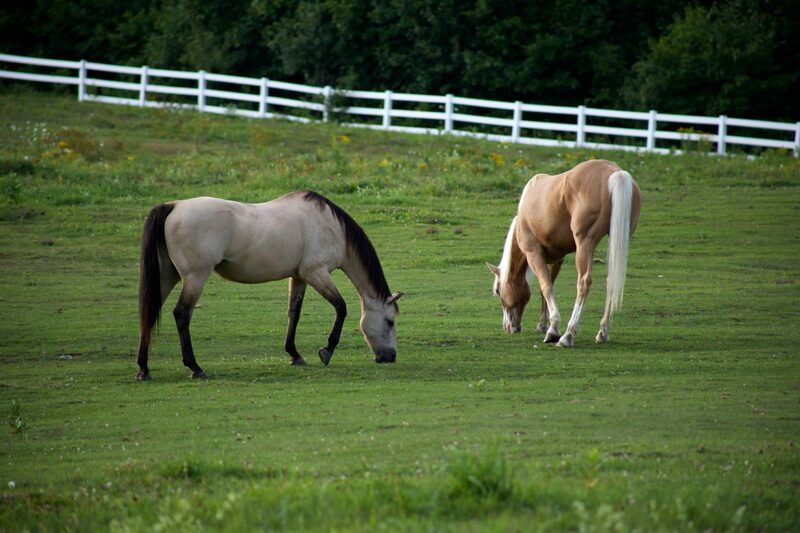 Much needed spaces for this horse loving family. 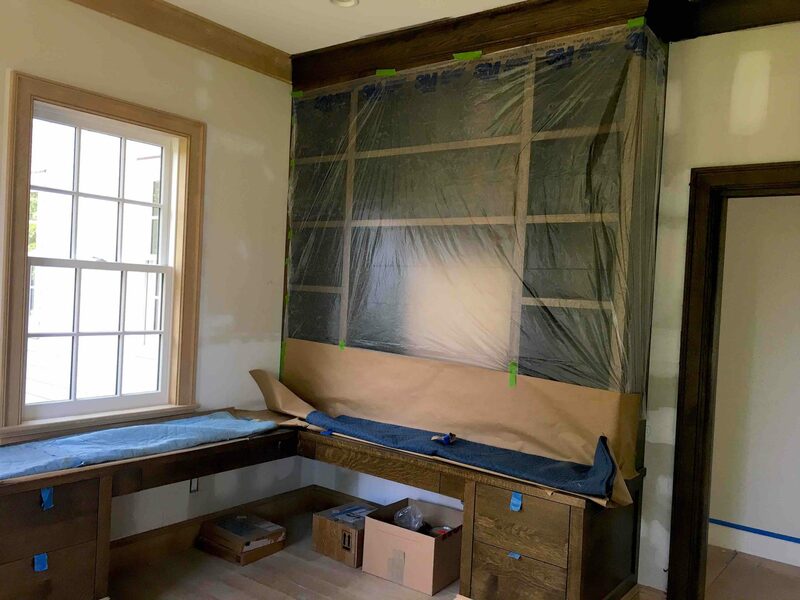 Echoing barn design with the window trim and unfinished oak panel detail. 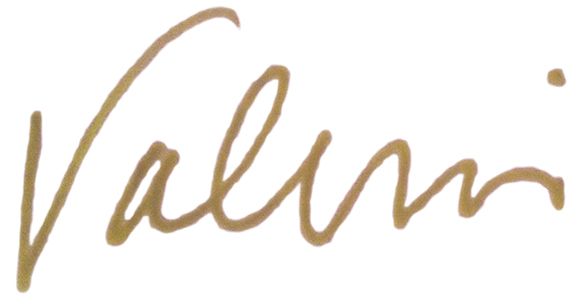 Creative space to complement the artistic talents of the client. Detail on ceiling is reminiscent of abstract art. Country gentleman vibe with deep rich wood tones and still to come wool chevron fabric wall covering. 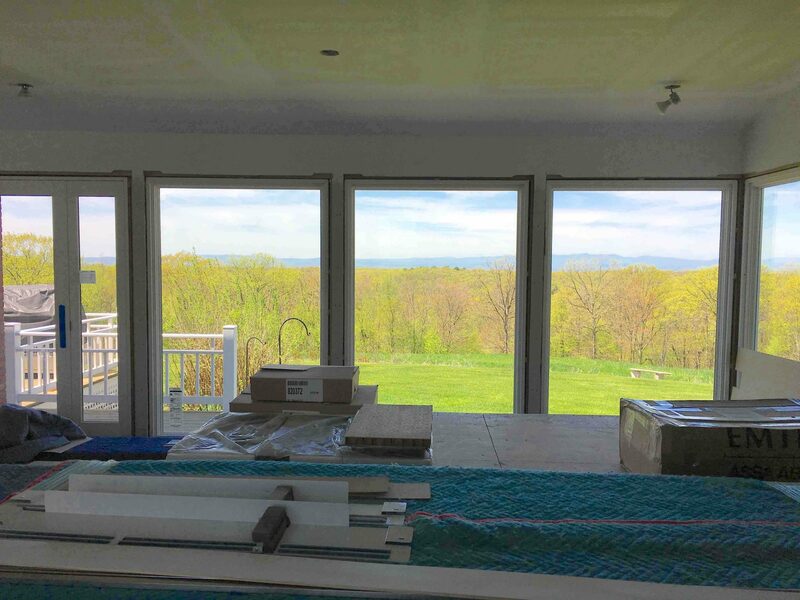 It’s ALL about the panoramic views with 3 walls of windows. 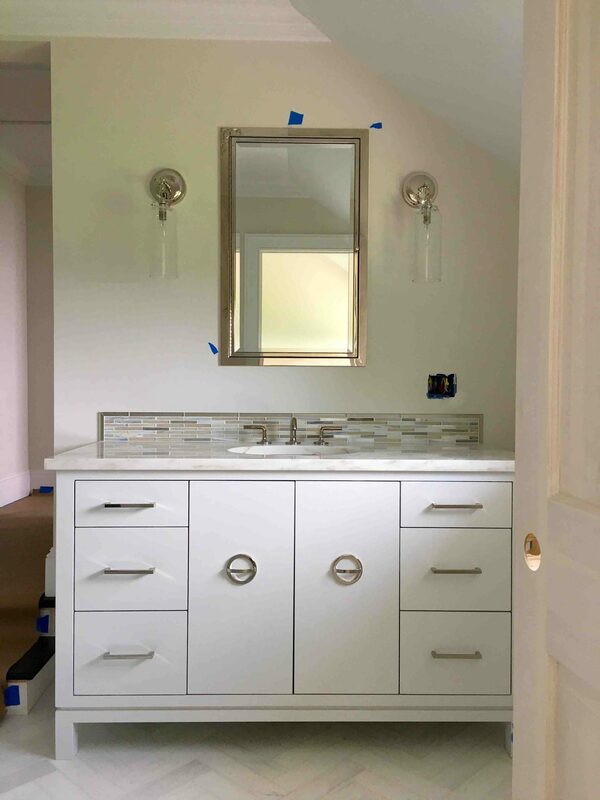 Combination of a beautiful marble counter top and custom walnut vanity with built-in medicine cabinets. Oversized shower area and freestanding tub with silver exterior. Flooring is honed marble set in a parquet pattern. 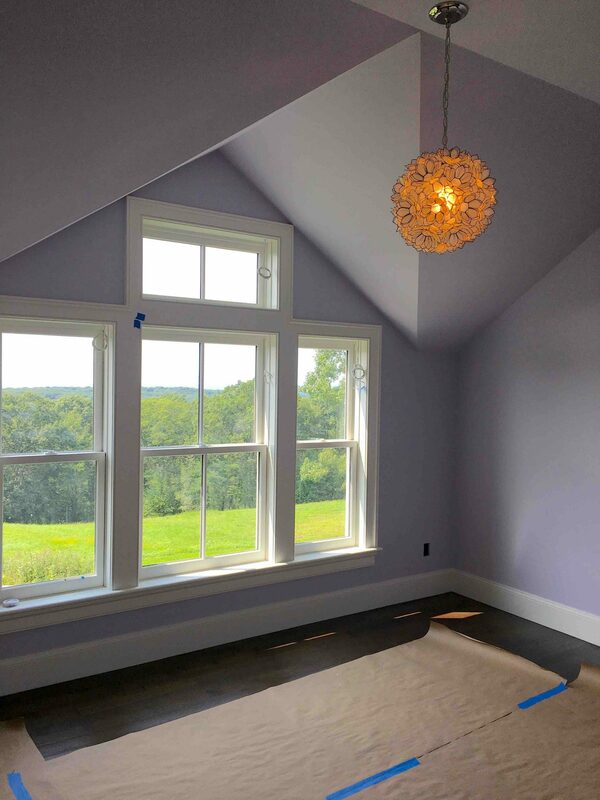 Created impact with a bold ceiling color and delicate ceiling fixture. Vanity – custom mosaic backsplash to complement the countertop. 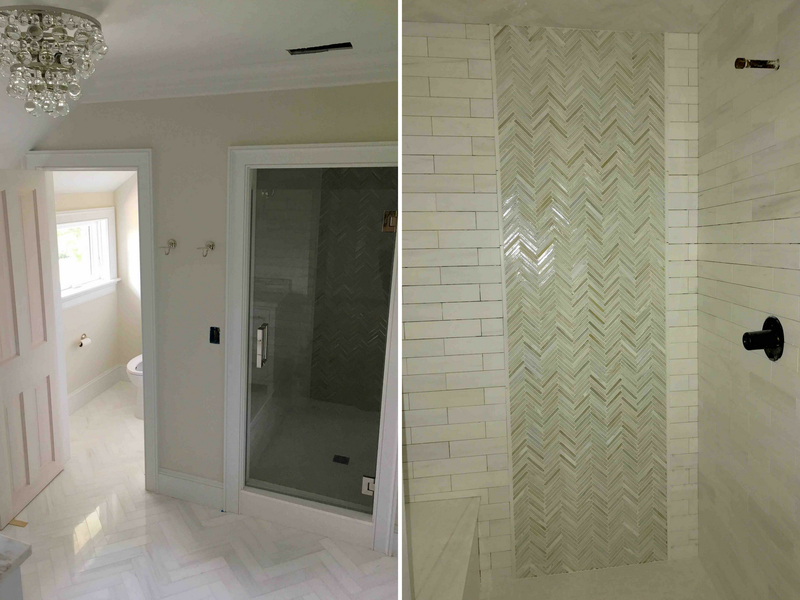 Chevron pattern on main floor carried through to shower wall detail. Her favorite color purple for all the walls!! 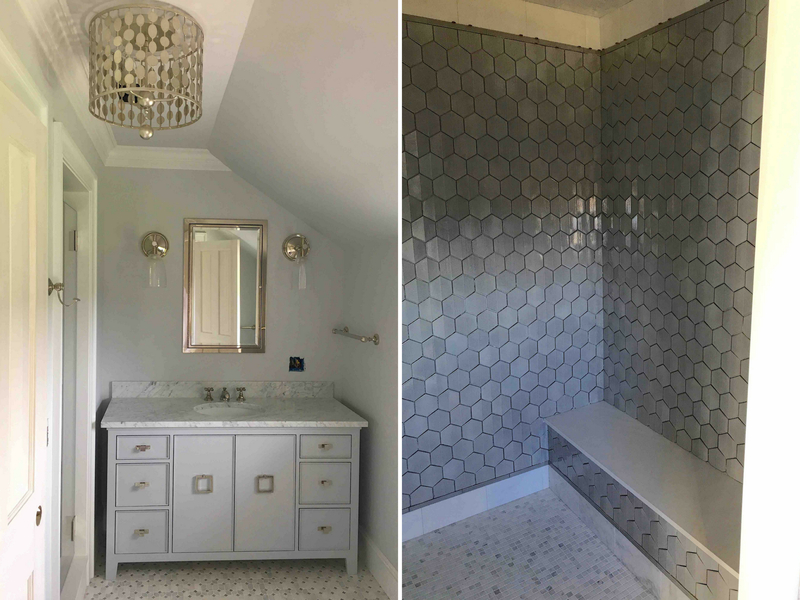 Shades of grey throughout – vanity, mosaic floor tile, shower walls and circular ceiling fixture. 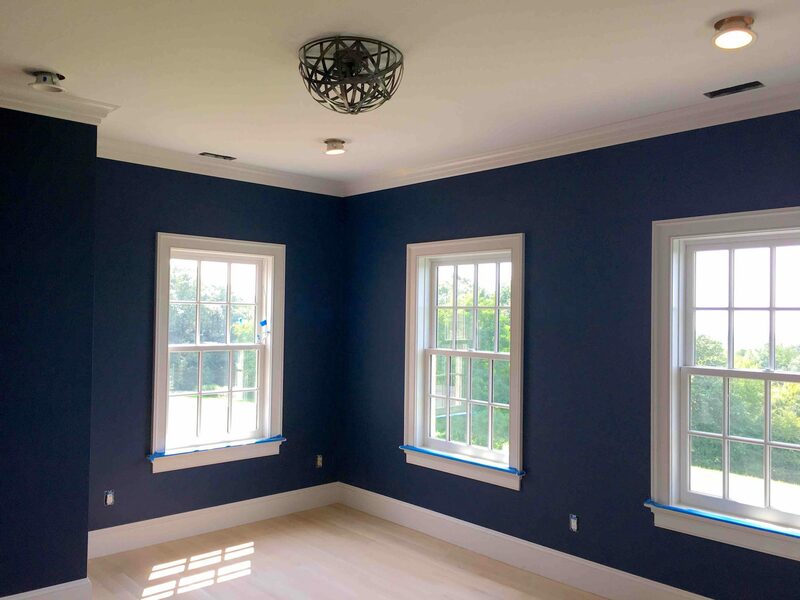 The deep navy blue walls will be getting a horizontal white center stripe for this Rugby enthusiast. 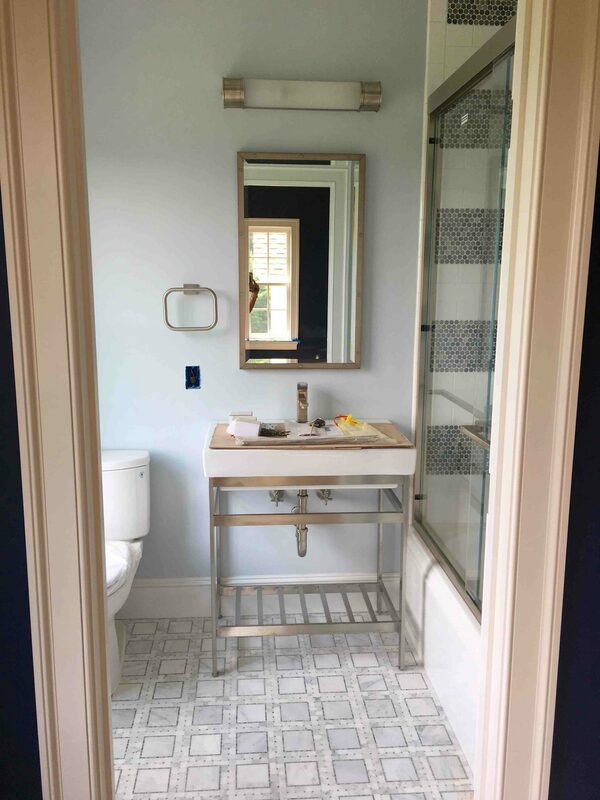 This theme was carried into the bathroom with the combination of mixed tiles to create the stripe pattern on the shower walls. A play on plaid on the main floor tile. I will keep you posted with more photos from the installation 🙂 There will be a lot to love.